WWI Profile: Susan Adkins Williams 1879-1938 | Friends of Fort Caswell Rifle Range, Inc.
Susie Williams was born and raised in Southport, Brunswick County, NC. Her father, mother, step-mother, and three siblings are buried in Old Smithville Cemetery in Southport. Susie and her remaining four siblings eventually moved to New York and New Jersey, living together at times. Only two sisters out of eight siblings married and had children, none of which remained in Southport. Their gravesites are unknown. 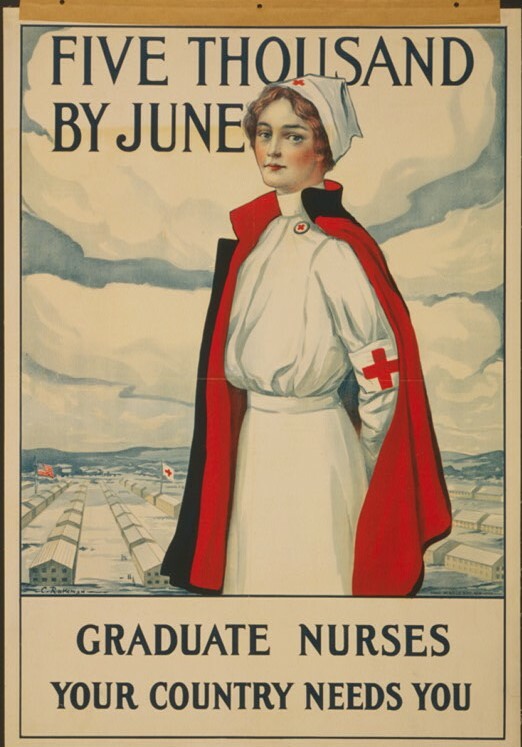 This poster may have inspired Nurse Williams to offer her services to the Navy on June 27, 1917. (The British and French governments requested that only graduate nurses be sent overseas.) 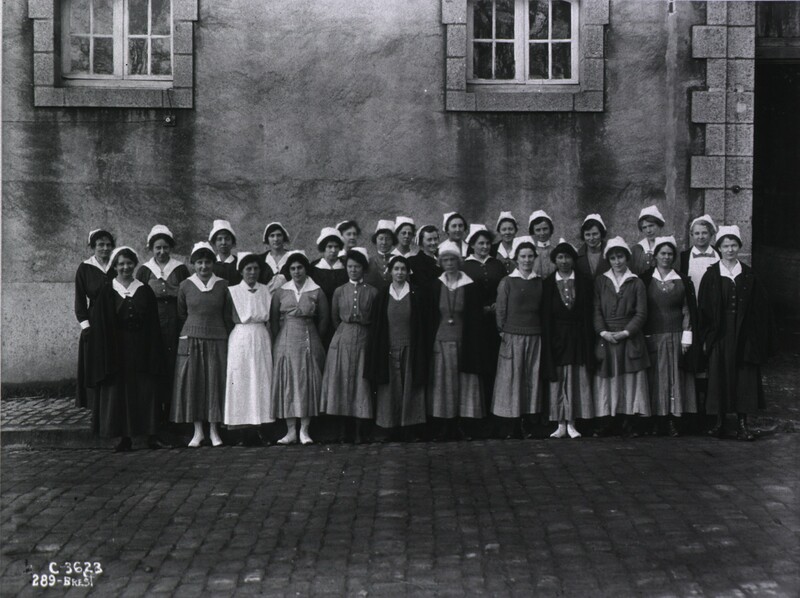 Nurses served without rank or commission and were not trained as soldiers, which was modified after the war, perhaps due to these women’s extraordinary service and bravery. At noon on September 11th, while I was stationed at the United States Navy Hospital, Brooklyn, the commanding officer told me to have forty nurses ready to sail for France in two days. It’s still hazy in my mind just what did happen during those two days. Kind people helped me ‘phone, others loaned their automobiles or ran errands themselves, the Red Cross stretched forth its mighty arm and the full equipment, including the uniforms, appeared. On September 14, 1917, the unit left Grand Central Station. It was early enough in the war for our uniforms to be new to the public. A regular officer of the Navy, Dr. L. S. Von Wedikind, with Dr. Vickery, took charge of the unit. Our destination was the Navy Yard at Philadelphia and we walked from the train to the U.S.S. Henderson. It was the first time officers and crew had ever had women traveling with them and the nurses found things as interesting as the crew found us. The following Sunday evening, the Sixth Division of Marines came aboard, about 1500 men under Major Hughes. Comparatively few of this division lived to come back. Two thirds of the officers were killed. After the Armistice Colonel Hughes passed through our hospital on crutches on his way back to the United States, a mere shadow of his former vigorous self. Monday morning [September 17, 1917] we slipped from our moorings out between the men-o’-war. In our convoy was the Cruiser San Diego [later sunk by a German submarine], with its great observation balloon which was up most of the time; two destroyers; a tanker; and two transports, the Finland and the Antilles, which was sunk on her return trip. Van Ingen gives a detailed story of the grueling experience at the base hospital with its inefficient heat, water supplies and cesspool; numerous mice, rats, maggots, and flies; and unsanitary operating conditions. The main building of the hospital was 4 stories, requiring multiple flights of carrying stretchers, food, water, coal, and excrement. She also writes of serving in field hospitals at the front lines and experiencing gas attacks. Back in Southport, NC, on November 18, 1917, The Wilmington Dispatch published the following account of a meeting of the Southport Civic Club. At the same meeting a Christmas box was packed to be sent to Miss Susie Williams, a Southport girl, who is a Red Cross nurse in France. She went with a Red Cross unit from New York. She writes that she wants to know of any Brunswick county boys who may be sent to France so she may look after them with particular interest and care. Our most serious cases were the measles and meningitis, especially the measles cases coming from the transports. The transporting of them from the ships to the hospital proved fatal to many. They were carried from the ship to the lighter, from the lighter to the dock, from the dock to ambulance, from ambulance to hospital. It sometimes took from six to eight hours to accomplish this. At this time these lighters were uncovered boats, mere barges, so that these sick boys were exposed for hours to the cold and rain. In September we began to get the “flu” cases from the States. Men brought in off the battlefields shattered and bleeding were not as tragic to me as these that came from our own ships. Men with the pallor of death on their faces, laboring for air, yet begging for food, their lips and tongues so glued together they could hardly articulate, and before we could care for them they would be out of their agony, beyond the want of food and water. Many died on their way to hospital or as they were put on their beds. … I think we all aged with the awfulness of it, and have our nights haunted with the memories of those weeks. The 1918 Issue of The Trained Nurse and Hospital Review reported this item from New York. A service flag containing thirty-four stars, representing the number of members of the Long Island College Nurses’ Alumnae Association who are in the country’s service, was unfurled recently at the rooms of the association, 186 Amity Street, Brooklyn. There were a number of visitors present and the Rev. G. Ashton Oldham, pastor of St. Ann’s Presbyterian Church, made an address. Margaret Ainslee, Ruth Bentley, Caroline Ballantine, Agnes Brankin, Lulu Brady, Caroline Bradshaw, Manon Bryant, Ann Burgess, Lettie Bellinger, Mary Badger, Lelia Church, Margaret Caldwell, Margaret Enright, Esmee Everard, Lottie Grass, Florence Grand, Maude Hicks, Alice Hamilton, Isabel Holden, Helen V. Kenney, Lulu Kinsella, Elizabeth Mignon, Rose McMullen, Mildred Overton, Florentine Ryan, Helen Spaulding, Bertha Spearman, Anna Thompson, Margaret Vassie, Emma Waiss, Susan Williams, Alice Zeigler, Laura Brown, Blanche Swan, Pauline Rose. Nurse Williams boarded the U.S.S. Leviathan on February 3, 1919, returning to America along with Chief nurse Van Ingen, who made the same trip with her to France at what must have seemed a lifetime ago. Like many other nurses, Susie returned to private nursing, perhaps assisting war veterans as many former Navy nurses did. And like many military nurses, she never married. Susan Adkins Williams succumbed to pneumonia on February 23, 1938, and was laid to rest at Flushing Cemetery, Queens, NY. The State Port Pilot published her obituary. Miss Susan A. Williams, who was born and reared in Southport, died Saturday in New York City following a short illness with pneumonia. The deceased, who was 58-year-of-age, was the daughter of the late Captain and Mrs. J.A. Williams, of Southport. She was a registered nurse, and for the past few years has held a responsible position with the Metropolitian Life Insurance Company. She was a member of the American Legion by virtue of her service in France during the World War, and last summer she paid another visit to French soil. She has no immediate relatives in Southport, but is survived by one brother, Raymond S. Williams, of New York; three sisters, Miss Leila Williams, Mrs. Beatrice Potter, of New York, and Mrs. George Reid [Reeves], of New Jersey. Her funeral services were conducted in New York, and interment was made there.